North Conway, NH – A Conway man has been charged after he allegedly crashed his car into a local gas station. 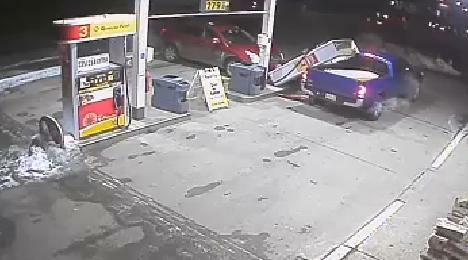 According to the Conway Police, 81-year-old Philip Murray is being charged with driving while intoxicated after he allegedly hit a gas pump at Rapid Roys in North Conway Friday night. Police believe he was attempting to make a turn onto River Road. Security footage of the accident posted on the gas stations facebook has received almost 30,000 views. In the video the red Cadillac can be seen slamming into the gas pump knocking it into a blue pick up truck on the opposite side. Click Here to view the security footage video. According to the Conway Daily Sun the owners of the station Roy and Elda Towle said that thankfully all of the pump’s safety features worked perfectly. They were also thankful for the quick response of Police and Fire crews as well as the actions of their employee, Chris Bell who called 9-1-1 and turned off the power to the pumps, to prevent any further accidents. The pump was back up and running by the end of the weekend. Murray is due in court on February 14th.